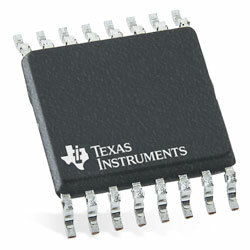 Texas Instruments TMUX1574 2:1 SPDT four-channel switch has a wide operating supply of 1.5V to 5.5V and is ideal for a broad array of applications. These applications vary from servers and communication equipment to industrial applications. The device supports bidirectional analog and digital signals on the source (SxA, SxB) and drain (Dx) pins and can pass signals above supply up to VDD x 2, with a maximum input/output voltage of 5.5V. Powered-off Protection up to 3.6V on the signal path of the device offers isolation when the supply voltage is removed (VDD = 0V). Without this protection feature, switches can back-power the supply rail through an internal ESD diode and cause possible damage to the system. Fail-Safe Logic circuitry enables voltages on the logic control pins to be employed before the supply pin, guarding the device against potential damage. All control inputs have 1.8V logic compatible thresholds, ensuring both TTL and CMOS logic compatibility when operating in the valid supply voltage range. Integrated pull-down resistor on the logic pins removes external components to reduce system size and cost. Applications include Servers, Data Center Switches & Routers, Wireless Infrastructure, PC/Notebooks, Building Automation, Grid Infrastructure, ePOS, Flash Memory Sharing, JTAG Multiplexing, and SPI Multiplexing.